On March 26, 1979, leaders from Egypt and Israel signed a landmark Middle East peace treaty negotiated by President Jimmy Carter. 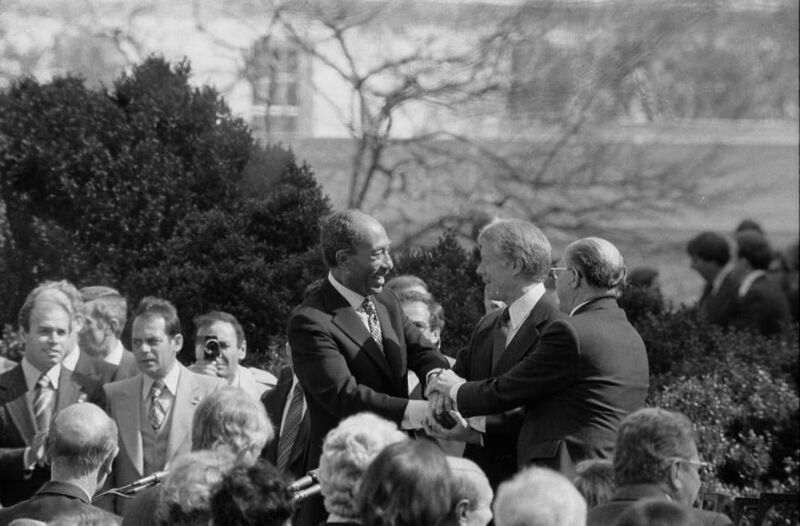 President Jimmy Carter, center, shakes hands with Egyptian President Anwar Sadat, left, and Israeli Prime Minister Menachem Begin at the signing of the landmark Egyptian-Israeli Peace Treaty on the grounds of the White House in March 1979. On March 26, 1979, leaders from Egypt and Israel ended more than 30 years of hostilities with a landmark peace treaty signed in Washington, D.C. The treaty was largely attributed to the so-called “Camp David Accords” of a year earlier, named after the presidential retreat in Camp David, Maryland, where President Jimmy Carter negotiated the accords with Egyptian President Anwar Sadat and Israeli Prime Minister Menachem Begin. The treaty ended Israeli occupation of the Sinai Peninsula. This included withdrawal of both military and civilian personnel, as well as an end to the economic occupation of oil fields in the Sinai. The treaty also established an outline for increased autonomy for Palestinians in Israel’s West Bank and Gaza Strip regions—today’s Palestinian Territories. Sadat endured massive opposition from the Arab world. Many leaders interpreted the treaty as an indication that Egypt would no longer support Palestinian independence or Syrian and Jordanian opposition to the Israeli presence in the Middle East. In 1981, Sadat was assassinated by extremists in the Egyptian military who opposed the treaty. agreement, usually a settlement of a dispute. people and culture native to the Arabian Peninsula, North Africa, and Western Asia. to think to be caused by. grief, or a period of intense mourning. person who supports radical (extreme) political or social positions. group opposing, criticizing, or protesting another, usually larger or more well-known, group.